I learned how to make Christmas buffet recipes many years ago. Serving dinner buffet style has always been a favorite of mine. When I have a dinner, I like to have time to visit with my guests. This is why I have the dinner! This is especially true at holidays like Christmas time. We are busy all through the year and this special holiday is a special time for visiting with friends and family. Considering all the added hustle and bustle at holiday time, we usually want to simplify our entertaining but still making it elegant. When I was learning how to make Christmas buffet recipes I realized that they can be anything from a buffet of simple finger foods to an elaborate meal. For this special holiday I prefer the more elaborate. This doesn’t mean that the foods have to be terribly expensive or fancy; simple foods are often much more tasty. This is the time to pull out serving dishes that you never use to spruce up your table or collect greenery from the pine tree to decorate your table. The great thing about a buffet, everything can be ready the day before and all you have to do is put it in the oven or fill the bowls. There are some important points I want to make about this type of dining. First, for a dinner buffet the guests must be provided with a place at a table to sit down and eat. It is also important to decide how the water or beverage will be served. These glasses should be ready on the table (or tables) where your guest will sit down; before they sit down. Unless you have help who will be serving while you dine, pitchers should be available for refills; I find this works best sitting on the table to be passed. Napkins and utensils can be placed in advance on the eating table at each place or on the buffet table. This choice also goes for condiments like butter, salt and pepper. When you learn how to make Christmas buffet recipes you may choose to have a small separate table for salads, one for desserts and one for coffee, tea or other drinks. Considering that we are entertaining within our homes and space may present a problem for added tables, I will be placing everything on the buffet table. That is except for the coffee and tea which can be served at the end from the kitchen by you or another guest; maybe from the bar, kitchen table or small table wherever it is convenient. Write out your complete menu so you can decide where each item will set on the buffet table. Arrange your table ahead of schedule; decide which end your diners will begin serving themselves. I am a big fan of tablecloths. I start by covering my table in white; white looks clean. If you do not have tablecloths, substitute. Remnants of materials work well in decorating tables. I have used white sheets before; wash in bleach water and ironed. Quite often at the back of the table I will use stacks of books to elevate places to set baskets of bread or rolls and maybe a table arrangement. Drape these stacks of books with other colors of cloths like red or green or prints for Christmas. At the end of the table where the guest line will start, stack dinner plates and small salad bowls; it is nice if you have Christmas dishes. If I did not have Christmas dishes or solid colors like red, white or green, I would use a firm disposable plate, although I do not like disposable plates. Appearance and presentation adds a lot to Christmas buffet recipes. Next to the dishes, start the meal by placing the salads; I actually place the bowls and dishes on the table and label them with what will go inside. This helps in planning for the space. For salads I always like a well mixed tossed (a clear bowl is nice for this if you have one). A tossed salad can be washed and drained the day before and placed in a large plastic bag in the refrigerator. If you use cherry tomatoes or grape tomatoes instead of cut ones, they also can be added to the salad now. Provide salad dressings next to salad, at end with condiments or on the eating tables. 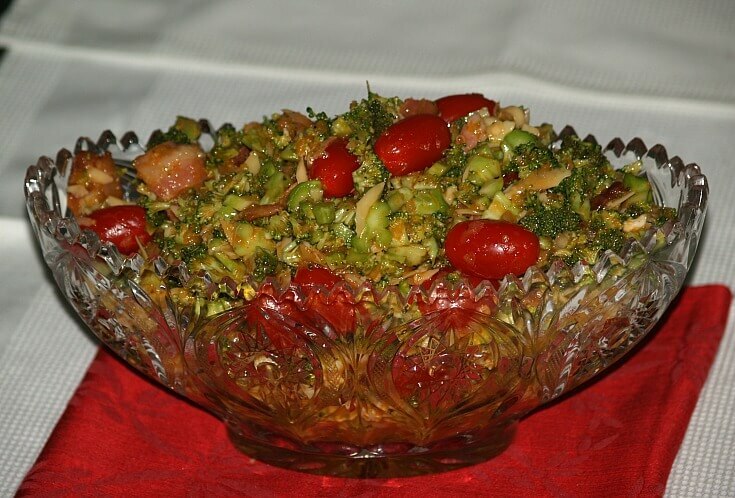 I prefer to add at least one more salad to the dinner; a red and green Christmas salad goes well with the occasion. Having light salads are important because this time of the year there is an abundance of heavy rich foods. NOTE: Most of these Christmas buffet recipes serve 6 to 8 people; they can easily be doubled. Usually when providing a lot of food on a buffet, people take smaller servings. Cut broccoli in very small pieces; add onion, bacon and Swiss cheese and mix to blend. Add Italian dressing and tomatoes; fold carefully (do not damage tomatoes) to blend. This does not take long to bake but it must be done right before serving. It can be prepared in a baking dish the day before, covered and stored in the refrigerator; mix the sauce the day before. Mix mayonnaise, cucumbers and dill; cover and refrigerate. Grease large baking dish; arrange salmon in single layer; salt and pepper each filet. Place thin slice of lemon and a sprig of parsley on each salmon steak. When ready to bake, remove foil and add wine; replace foil and bake 15 to 20 minutes at 350F degrees or until salmon test done. To serve arrange salmon on platter and spoon sauce down center; garnish with fresh parsley and small tomato pieces. Next to the entrée dishes are some accompanying dishes. 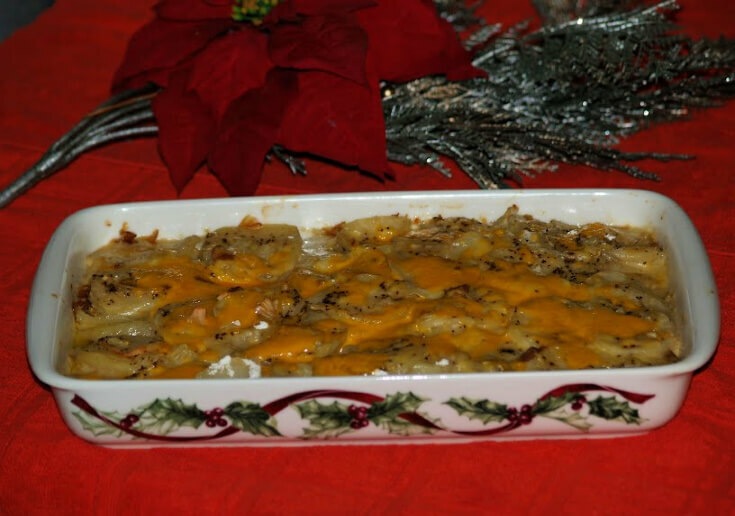 With ham I like Christmas buffet recipes like scalloped potatoes recipe. Here casseroles are great! They can be prepared the day before and add such flavor to the meal; also they stay hot longer for serving. NOTE: Remember when heating dishes from refrigerator, set out to room temperature before putting in hot oven. Simmer carrots and zucchini in water and salt for 10 minutes; drain off any water. Melt 2 tablespoons butter in saucepan and stir in flour; slowly stir in half and half. Add and stir in bouillon cubes, mustard, dill, nutmeg and pepper; cook and stir until thickened. Add carrots, zucchini and onions; pour into greased 2 quart baking dish. Combine topping and sprinkle over casserole; cover and refrigerate until day of serving. When ready to heat bake for 25 to 30 minutes at 375F degrees. Alternate layers of potatoes and onions in a greased casserole baking dish. Dredge each layer with flour, dot with butter and season with salt and pepper. Combine and mix soup with milk and pour over mixture. Cover and bake at 350F degrees for 1 ¼ hours. Option: Sprinkle cheese over the top and return to ove to melt. NOTE: If you choose to prepare this dish in advance bake it for 1 hour, let cool and refrigerate; bake the next day for about 45 minutes. With all the Christmas buffet recipes, a pretty Christmas cranberry salad will serve well as a light dessert. Chop cranberries finely in food processor; mix with sugar and set aside. Dissolve gelatin in boiling water and stir until all is dissolved: stir in cold water. Stir in lemon juice, cinnamon and cloves; chill until thickened. Fold in cranberries, orange pieces and nuts; spoon into 5 cup mold and chill until firm. Unmold on plate and garnish. NOTE: To unmold, place hot wet towel on bottom of mold. It is nice to add an old family favorite to you Christmas buffet recipes, so here is mine. Although rich and sweet (considering all the holiday treats) it is always a hit! This easy banana pudding is made easy with box pudding. Combine first 3 ingredients with mixer; add milk and flavoring. Stir in the Cool Whip and layer in a serving bowl; first broken wafers, then banana slices, then pudding mixture. Continue layering and then top with graham cracker crumbs; refrigerate until serving. After the Christmas buffet recipes are on the table, place utensils, napkins, butter and condiments at the end so the guests can pick them up right before sitting. Of course, if you choose to place these on the eating tables, you can omit them here. Remember to make sure all Christmas buffet recipes are easy for guests to move from serving dishes to their plates. This means meats should be already cut into serving pieces and utensils must be provided with each dish. Don’t forget to place breads on the table, maybe dinner rolls and even slices of sweet breads. Now that you have all the Christmas buffet recipes on the buffet table; the dinner dishes, serving dishes (marked with what will go in them), platters, places reserved for casserole dishes, bread baskets, etc., utensils & condiments if desired, and any table decorations, cover entire table with a clean sheet or large tablecloth. Just lift the cloth and you are ready to fill the bowls. NOTE: I do not recommend candles; they interfere with reaching and might cause burn. I hope you enjoy these Christmas buffet Recipes. I want to thank all of you for being part of Painless Cooking and I wish a very Merry Christmas to all of you and a wonderful and happy New Year.